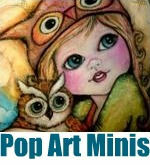 Pop Art Minis: I Went Back To The Drawing Board with a little "Let It Snow!" I Went Back To The Drawing Board with a little "Let It Snow!" It's been a while since I've taken the time and felt really inspired to work on a new Pop Art Mini design, but today was the day. 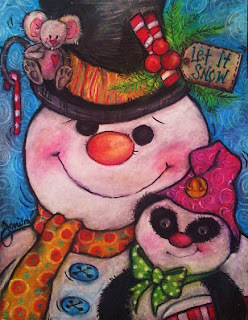 Motivated by a Pop Art Minis facebook Giveaway I'm putting together I decided that the theme would be "Let It Snow". . . thanks to alot of input from my friends on facebook! Inspired and ready to go I pulled out the oil pastels and the result . . .
a silly little snowman with a tip top, top hat, a perfect little panda-santa friend (sans the beard) and Milly the Mouse sitting happily on the brim of the top hat . . . a few candy canes, holly berries and snowflakes swirling in the background and wha-la . . . ready, set, "Let It Snow!" A little video that shows the design from start to finish! 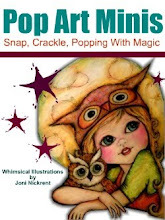 I love it Joni! He has the perfect smile on his face. I will treasure the one I have! Snowmen are my fav! !